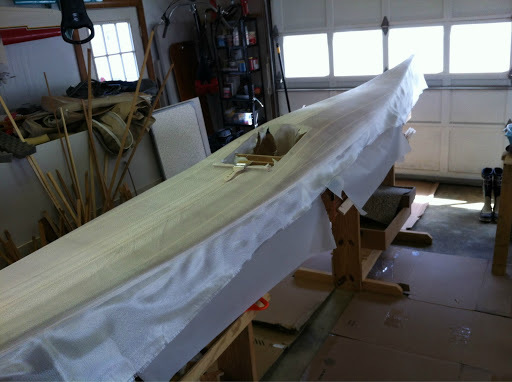 While I have fiberglassed pieces and repaired parts of boats in my history, none of that quelled the anxiety of fiberglassing a whole boat for the first time. Nonetheless, to finish requires continuing on. 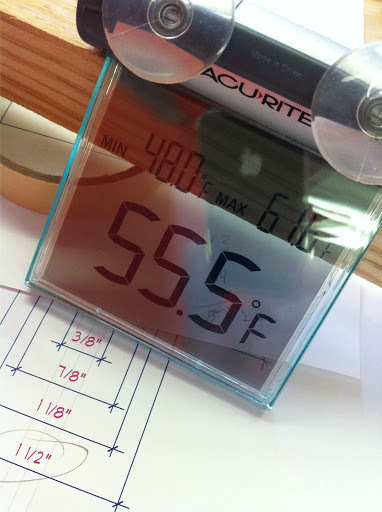 Though Spring hadn’t really sprung, this past Saturday did offer temps in the 60 degree range allowing me to use both quartz and kerosene heaters to reach 75+ degrees in the garage.The glassing process sounds simple: have your tools ready (chip brush, stirring sticks, paper mixing cups, foam “hot dog” roller, squeegee, etc. 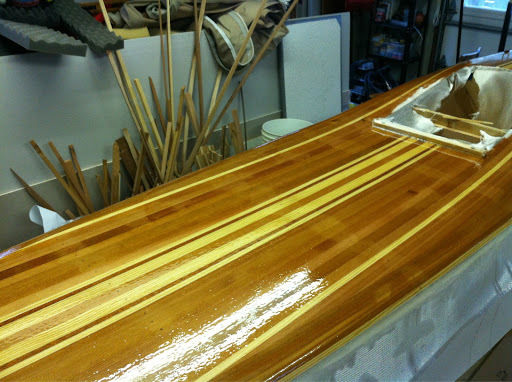 ), lay out the glass, smooth it with a soft brush, mix epoxy, pour that onto the boat, and distribute the goo by brush and squeegee. After all the build up, it was time to take the plunge. So, we began on the deck. I had decided a horizontal surface was perhaps the best way to begin. 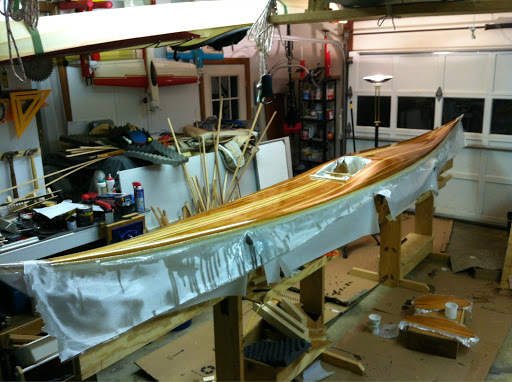 I worked the epoxy around the cockpit and had perhaps 1/3 of the deck surface wetted out before stepping back for a peak. At 1st glimpse I was happy with the results. I still nervous about the epoxy pot life and having a wet edge to continue with, but the glass was translucent, brush hairs had been captured, and there were no white areas from too little epoxy. None of this concern was really necessary as the Raka material is very patient, and at the temps I was working with, it allowed for plenty finessing. The whole operation was going well. I even began to relax, when to my horror, I saw a faint color difference where I had previously patched nail holes. Had the epoxy not soaked in there? 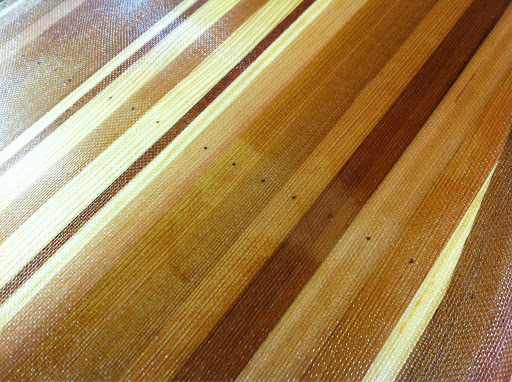 No, I apparently hadn’t sanded the residual epoxy entirely off the boat when filling those holes. 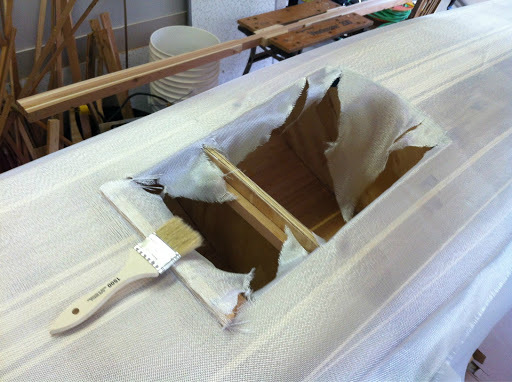 As a result there was a slight barrier preventing the fresh epoxy from fully soaking in. I can’t tell you how bummed I was (and still am to some extent). After all the prep and what I thought to be conscientious studying, I had this disappointment. The thought of pulling off the glass and trying to remove the epoxy proved too daunting so, I elected to continue on, all the while kicking myself. I even debated on not posting this report. Strategic photos could hide the screw up. My middle son was quick to say it is hardly noticeable. I don’t know. I see it, and to know it didn’t have to be really irks me, especially after I tried both water and mineral spirits on several of these areas to satisfy myself that the filling could stay as is. Well, bad analysis there. It is done. 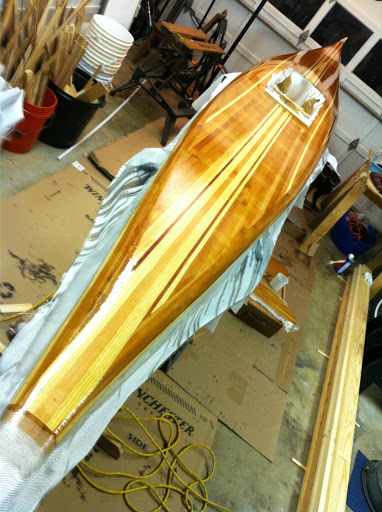 No structural flaws and the remaining 2 fill coats worked fine. 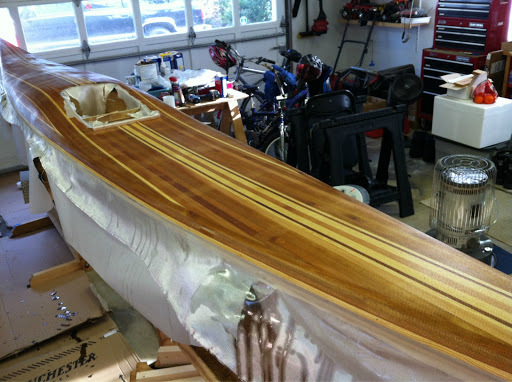 The 3 epoxy coats were separated by 8 hrs hardening time or at least until no longer tacky so that the coats will bond to each other without sanding.On with the show. Here are the photos. Chica was hauled to the heavens for more ground. A warmer day, but not warm enough. 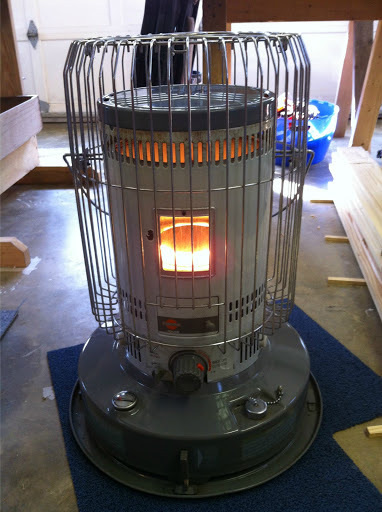 12k btu kerosene heater pushes some heat. 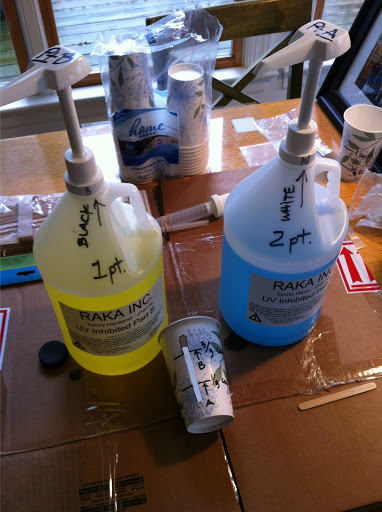 Raka’s UV epoxy here. I wanted to make darn sure the pumps stayed with their proper bottles. Also shown is the 12 oz. paper measuring cup for metering the juice. Not my idea, but I don’t recall who to give credit. I worked with 1 cup mixes. Perfect really. After marking 1/3 cup intervals on one cup, it was placed inside another with a window and marks were transferred. Though pumps seemed accurate, this prevents you from forgetting the count. A template of the cockpit’s inside curve marked the limits of glassing required. 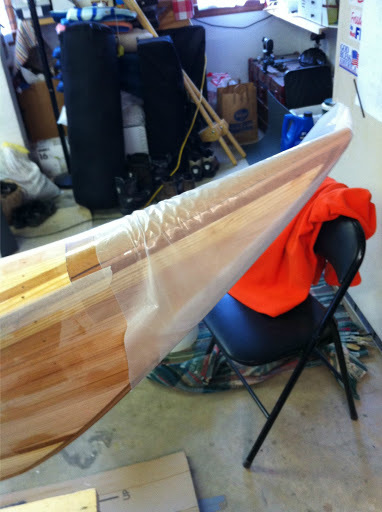 I covered the stem ends from epoxy. 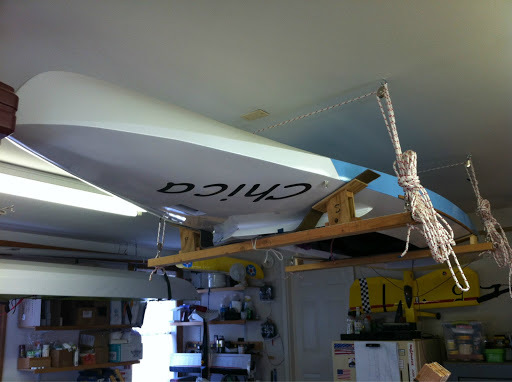 These are already glued to the hull. A chip brush smooths the cloth without snags and avoids oil from handling. Cockpit opening is cut for better lying of the glass. 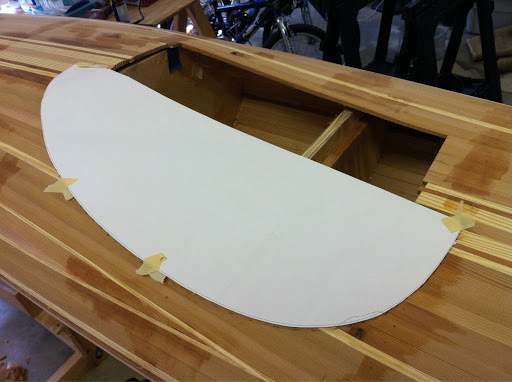 I did have to cleat the aft of the opening as it had released from the mould there. Forget the blemishes. Look at the super tight joints! The horror. 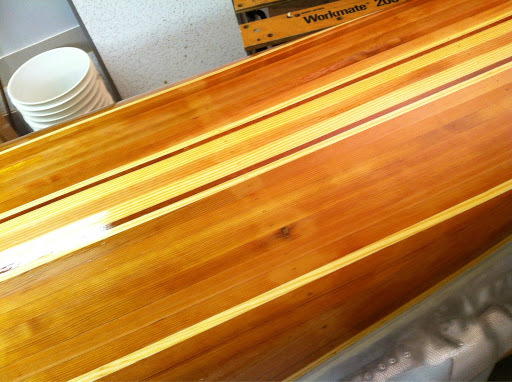 residual epoxy telegraphing through. So be it. After 1st coat. The rest was flawless too. Final fill coat displayed here. Cardboard prevents drips on floor. She’s still pretty even with the pimples. Guess I’ll ever get over it? Geeze (or some expletive)! 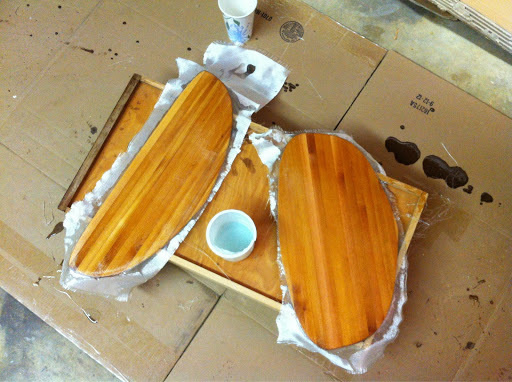 Bulkheads got one coat of epoxy & glass for both sides. Ciao!